Welcome back to More Agreeably Engaged, Shannon Winslow! I'm so happy to have you visit again. 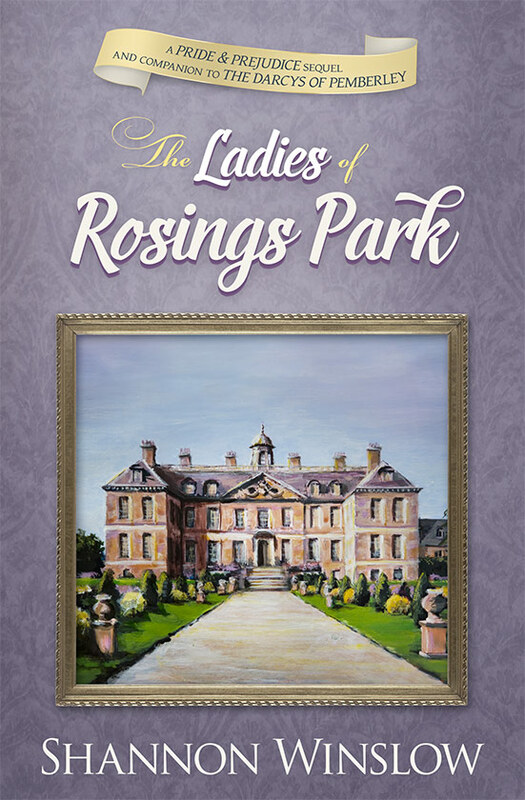 Your new book, The Ladies of Rosings Park sounds fascinating. It will be great to see Anne de Bourgh have her day! I like that idea. I also love your cover. Your paintings are gorgeous and this one is too. Ms. Winslow, take it away. How well did Darcy treat his cousin Anne? Part of our enchantment with the man (and the reason Elizabeth changed her views about him from negative to positive) comes from discovering that he was truly honorable after all. He did not disrespect his father’s wishes. He did not cheat Wickham out of the living intended for him. In fact, he earned the respect (even affection) of his tenants and servants and was affable to the poor. In short, Darcy was a man who held high principles and lived up to them. But did he treat his cousin Anne accordingly? I had wondered about this before, but it became a real issue when I started writing The Ladies of Rosings Park. Even though Darcy obviously didn’t feel bound by his mother’s and aunt’s desire that he should marry his cousin, I wanted to know that he treated Anne kindly and considerately. After all, she had heard all her life that he was supposed to marry her, and it was just possible that she believed it and had her heart set on it! Two things Anne de Bourgh understood from a very early age: first, that she was loved by her father, and second, that she would one day marry Fitzwilliam Darcy. These unalterable facts served as the sure foundation of her young life… But nothing lasts forever, it seems, not even sure foundations. One pillar of support crumbled when Anne’s father suddenly died a month shy of her fourteenth birthday. A few years later, the other – her betrothal to Fitzwilliam Darcy – was cast into serious jeopardy upon the arrival at Rosings of a young woman by the name of Elizabeth Bennet. That’s not much to go on, but the good news is it meant I could fill in that giant blank any way I wanted! Obviously, Darcy belongs with Elizabeth, not with Anne or Miss Bingley. That is a truth universally acknowledged! But it would tarnish even their incandescent union if too much carnage and destruction had been left in their wake in order to achieve it. Because of the kind of person she is, none of us mind that Miss Bingley’s ambitions are frustrated. But Anne was an innocent bystander. I would hate to see her heart trampled. So I set about developing her relationship with Darcy as I saw fit – some insights into past events, Anne’s current feelings, and some meaningful interaction between the two as the story goes along. I also wanted to show some signs of a burgeoning friendship between Anne and Elizabeth. All this with an eye to the three of them coming through with mutual understanding and respect. Above all, I wanted to be sure that Anne (as well as the reader) had no reason to feel that Darcy had dealt with her dishonorably. Phew! That was a tall order, but you’ll be glad to know Darcy’s good character comes through undamaged. Yay! What might surprise you more, though, is how Anne was at work behind the scenes. She not only didn’t stand in the way of Darcy and Elizabeth’s happiness; at some personal sacrifice, she actively promoted it. Sounds to me like she deserves a HEA of her own. Don’t you agree? 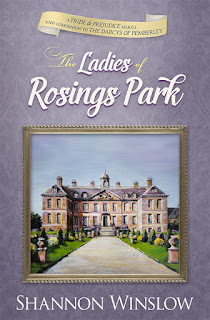 Shannon Winslow is giving away one eBook of The Ladies of Rosings Park and this giveaway is international. Please leave a comment to enter. What do you think of Darcy's treatment of Anne? Do you think him honourable? Do you think Anne deserves a HEA of her own? I certainly do and I've a feeling that Shannon Winslow is going to give her one! Giveaway ends at 11:59 PM on the 8th of April. Good luck to all. Thank you for visiting my blog again, Shannon. It is always such a pleasure having you stop by and talk about your books. I agree with your sentiments that Darcy belongs with none other than Elizabeth. That definitely is a truth universally acknowledged! :) I look forward to learning more about your book, and I wish you the best with The Ladies of Rosings Park. Please come back for a visit anytime. I don't it would cross Darcy's mind to inform Anne that he would never marry him. I think he would just presume that she didn't want to because she was unwell, or in his normal arrogance he presumed she did like all the females he met. Haha! I didn't like to think he would be so insensitive, but maybe you're right! I don't think he was dishonorable but could have done better by her. I definitely would love Anne to get a HEA. I would love Anne to have a HEA as well. Thanks so much for hosting me and "The Ladies," Janet! It's always a pleasure to visit More Agreeably Engaged. It was great to have you and "The Ladies" visit, Shannon. You are always welcome and I hope you will visit again soon. Darcy is always honorable, but he evaded the Anne relationship by not telling Lady Catherine and Anne right off that he would not marry her. I have always thought that Anne was relieved as I think that Darcy quite intimated her by not speaking! It will be interesting to see what Anne is thinking and can she stand up to her mother. Yes, I think if they had met as adults, Anne would have been completely intimidated by a man with such an imposing presence. The only thing that might make Darcy more approachable to her is that Anne has known him since childhood. You have some good thoughts, Eva. Thanks for sharing them. From what we read in canon, Anne and Darcy definitely do not suit! I too have wondered about that, but I always felt that Darcy and Anne would have talked on their own at some point in time...though Jane never states that. I think though that it is implied based on all his other honorable interactions. That's certainly the way I chose to interpret things. I think it may be more the film adaptations that created that doubt in my mind, since he's shown completely ignoring Anne. I agree with you completely, Carole. Thanks for stopping by and sharing your thoughts. Good luck. I'm looking forward to this new release. Congratulations Shannon. Thanks for dropping by, KateB. What a very clever premise for a book!!! Must admit I'm quite impressed and intrigued at the ladies having their share of the conversation and relating matters, in their own unique perspective,as they unfolded in Kent!! I always like to think that Anne didn't really mind not being chosen as Darcy's bride as, due to her poor health,I don't think she should bear children,plus the fact that they are cousins means that they have more of a somewhat estranged sibling relationship rather than one necessary for that of a husband and wife. It will be interesting to see Anne's opinion on the matter and how she actively encouraged Darcy and Lizzy's romance,presumably inherently understanding that they would be the perfect match for the other in both temperament and character. Yes,I'm definitely looking forward to reading and observing these birds' eye narratives from ladies who,though quite polar in their backgrounds,are bound together by the innate and universal feminine instinct that's called women's intuition! Best of luck with your book,Shannon. Janet,as always,thank you for a wonderful post! I'm glad you like the approach I've taken for this book, Mary. I had intended to tell the story all from Anne's point of view, like I did with Georgiana in "Miss Georgiana Darcy of Pemberley," but then I realized how much I would be missing to limit myself to one speaker! I'm please with how it all worked out, and I already have plans to use this technique again. You are welcome, Mary. It is always lovely to read your take on a post. It's great to have you stopping by. I feel the same as you about Anne. Darcy likely considered the marriage premise more of a 'family fable' than a serious 'fact' and had no intention of being guided from the grave. Anne, on the other hand, tended to cling to the idea as a security plan for her future that was always overseen my her mother. But maturity brought more understanding and doubts. So glad she and Darcy came to an mutual agreement that it wasn't to be. It always seemed to me that the fable was more fabricated by Lady Catherine than his mother. This does sound like a more mature Anne, doesn't it. Thanks for stopping by. I would like to think that Darcy conducted honourably towards Anne and discuss with her to end this so called betrothal. We as the reader do not know if Lady Anne Darcy agreed to this arrangement or it's merely Lady Catherine's wish. I hope Anne find a gentleman who would love and cherish her for herself and not for her fortune.